The budget-priced Phoenix 98900 Power Rower cuts too many corners where quality is concerned and the result means frequent maintenance issues. The four LCD window display shows time (up to 99:59), distance (up to 99.99 miles/km), calories and speed. It features a dial to change up the resistance and a foldable frame. 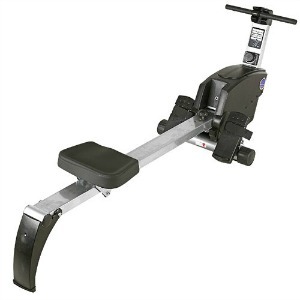 Check out the Phoenix rowing machine on sale at Amazon! The Phoenix 98900 Power Rower features magnetic resistance and a belt drive mechanism. Other specs include a 46-inch slide length for the seat, foot straps, a 250-lb user weight capacity, and a molded polyurethane seat. It folds and rolls away for storage and comes with a 90-day parts, 1-year frame warranty. The magnetic resistance adjusts with a turn of the tension dial at the base to increase or decrease the workout; however, it doesn’t provide much tension at the highest level which will disappoint users in good physical condition who won’t feel like they are getting a good workout. Other problem issues include an overall cheap feel to the machine including a plastic (not rubber) handle, a dark monitor window which isn’t backlit and is hard to read, inaccurate feedback for the amount of calories burned, and a very limited warranty. Users have reported in some reviews that they have received machines with a broken shroud right out of the box. As for performance, the flywheel is not well engineered and tends to scrape and squeak. Eventually, the belt breaks off of the flywheel. You noticed the $265 price on the Phoenix 98900 Power Rower which led you to check out the reviews. Hopefully by now, you have changed your mind about buying one. Rowing is a superior form of cardio exercise and while rowers are much less expensive than treadmills and ellipticals, that doesn’t mean you can go this cheap and expect a decent machine. The plastic shroud and other parts are so poorly made that it’s only a matter of time before something breaks. Take a look at some of the other lower priced brands such as Stamina and Sunny Fitness, who have better options in this price range.